Many dieters turn to cottage cheese for weight loss, pairing it with fruits such as melons, berries and pineapple. This dairy food is high in calcium and other nutrients, but there are side effects to eating cottage cheese. It can cause various reactions, and its protein and sodium content may trigger health problems. Cottage cheese provides an excellent source of protein. 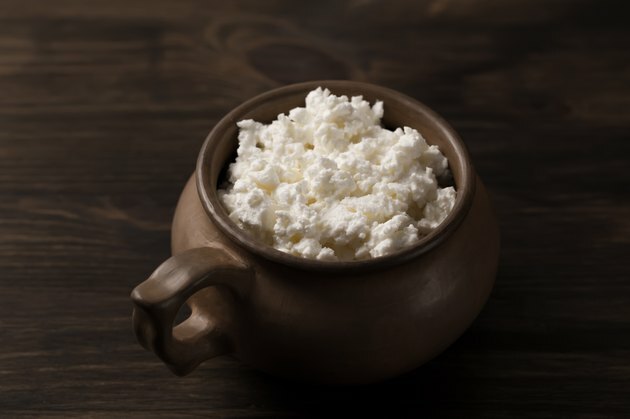 A 1-cup serving of full-fat cottage cheese has approximately 25 g of protein, while 2-percent milk fat cottage cheese contains a bit more at about 26.7 g. While your body needs protein for energy, muscle building and immune function, eating cottage cheese in addition to other foods rich in other proteins may provide too much. Eating a high-protein diet over a long period can put stress on your kidneys, which can decrease the efficiency of its waste removal function. The average diet includes 50 to 175 g of protein daily, or 10 to 35 percent of the calories in a 2,000-calorie diet. Many people have dairy allergies, which is primarily a sensitivity to a protein in milk known as casein. Cottage cheese is made of coagulated milk with some of the whey pressed out. Side effects of consuming cottage cheese when you have an allergy include skin reactions like hives and itching, facial swelling, breathing trouble and anaphylaxis. If you suffer from a dairy allergy, you can make your own non-dairy cottage cheese. While the flavor suffers, you can approximate the texture of cottage cheese by mashing tofu with a fork. Eating cottage cheese is not generally recommended if you have lactose intolerance. This condition makes it impossible to digest sugars present in dairy products; it occurs because your small intestine produces only small quantities of an enzyme known as lactase that aids food absorption. Consuming cottage cheese when you suffer from lactose intolerance may trigger diarrhea, bloating, cramps, flatulence and upset stomach. Your physician may prescribe medications that introduce more lactase into your body to make easier to digest dairy products. A serving of full-fat cottage cheese has 819 mg of sodium, while reduced fat cottage cheese contains 746 mg of sodium. This much sodium accounts for at least half the daily limit of 1,500 mg as reported by the American Heart Association. Consuming cottage cheese as part of a diet high in sodium can cause hypertension, which can increase your risk of heart attack and stroke. Can You Develop an Allergy to Dairy at Any Age? What Are the Dangers of Drinking Soy Milk?